Today we did three museums before the game (2 baseball and one Mik's choice pop art/comics mostly one), but I will get to that in later posts. By the time we were done with those and took our souvenirs back to the car Orioles Park at Camden Yards was just opening. The first half hour we could only go on Eutaw Street and part of outfield. That was kind of boring since we already walked Eutaw Street going to the museums. At least they do have some of the better concessions out here and all the stands here were open including souvenirs stands and the Team Shop. About an hour and a half before the game they opened access to the rest of the park. We walked around in search of the Noah's pretzels so I could have an 'O' one and then went back to our seats. The seats were decent as we could see the scoreboard and most of the field. Oddly it was part of centerfield that we could not see. The game itself was not that action packed, but it was not entirely dull either. There was some good pitching mixed in with the bad (i.e. quite a few walks). There really was not much in the way of great hitting, as in the whole game there were only 2 extra base hits. Both the extra base hits were doubles by Blue Jays. For the most part it was scoreless innings of baseball, as both Blue Jays runs came in the 5th. I do not think there were even any hits after the 6th or 7th inning. Overall a good park. The whole game experience other than the ballpark itself is a lot like going to the Nats. I still hate the stupid O chant they say during the National anthem, but it is not as dorky as when the Nats fans do it because they think it is a normal baseball thing since the Orioles used to be the closest team to D.C. They do not have racing Presidents or anything like that on the field, but some of the scoreboard things are similar such as the MASN guess the year thing. Also, some if the best local type food is the same (Noah's Pretzels in the shape of the team letter and Boardwalk fries). Update July 16, 2009: Finally got the photos uploaded from the game here and have added some to the post. I understand why they do it, but I also find it disrespectful. It does not make any sense at all when the few still do it at the Nats, though, since not only are they disrespecting the National Anthem, but they are basically cheering for another team. It is just really sad that they do that in Baltimore and that is basically were the National Anthem was written, which is not an excuse for them to mess with it. We also passed your truck on Saturday, July 11th in North Carolina. We think that it is wonderful what you guys are doing. 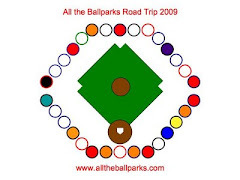 We also travel to different ball parks but just not in one summer. We have already seen all on the east coast and some in the midwest and the West Coast. Can't wait to see all of them. Our son lives in Arizona and works some for the Diamondbacks. So that is my second favorite team. I am a red sox fan. Have fun on your continued travels and stay safe on the roads our thoughts are with you.